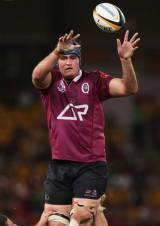 Lock James Horwill quickly became an important presence for both Queensland Reds and Australia following his Super Rugby debut in 2006. He was called in to the Wallaby squad and made his international debut against Fiji in 2007, unluckily missing the cut for the Rugby World Cup squad after his first full season at elite level. Horwill was handed the Reds captaincy in 2008 despite his youth, leading by example as he produced form that would win him a recall to the Wallaby squad for their Test season. He made an impact in their Bledisloe Cup showdown with the All Blacks in Sydney, dummying his way to a try in a famous 34-19 victory. A foot injury prematurely ended his season and he sat out their November Test tour of the northern hemisphere and the opening rounds of the Super 14. Upon his return to fitness he was immediately recalled to the Wallaby setup, getting back in to competitive action against Italy and France before starting their Tri-Nations campaign against the All Blacks with a defeat. After year out of the international arena, Horwill returned to the Wallabies squad and was named Wallabies captain ahead of the 2011 Rugby World Cup in New Zealand as he succeeded Rocky Elsom in the role.